(CNN) -- Chinese Premier Wen Jiabao will visit North Korea for two days next month, government officials and state-run media reported Monday. 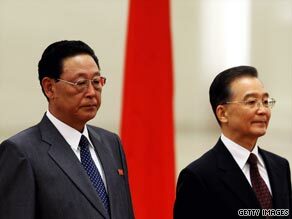 Wen Jiabao (right) and Kim Jong II will have talks next month according to reports. The trip set for October 4 to 6 is at the invitation of North Korea's government, according to the Korean Central News Agency. Wen will "exchange opinions on the development of Sino-North Korea relations and on issues of mutual concern," China's Ministry of Foreign Affairs said. He will also attend events celebrating the 60 anniversary of official diplomatic relations between the two nations. The planned visit comes amid efforts to draw North Korea back to six-party nuclear disarmament talks. North Korea pulled out in April, protesting the United Nations' condemnation over its nuclear test and missile launches. The six-party negotiations include the United States, South Korea, Japan, China and Russia. Pyongyang has recently signaled its willingness to re-engage with the United States.